So Now I've got your attention, it was the title of the Belfast telegraph this morning. It made me do a double take as I was driving past the Telegraph sellers that dice with pollution on the intersections in Belfast. The reason being that for some time now a friend of mine has said " have you noticed that in NI they love reporting death, near death or torture with animals on the news" when he first said this I didn't take much notice but then I started to hear it over and over again, a horse here and a cow knocked down there. After discussion we thought that after years of the troubles the reporters hear have got used to a certain type of words in their journalism and as the Peace takes hold they still like using the same words but now they look for it happening with animals not humans. Now that I have brought your attention to it you will begin to notice it.Actually you really notice the difference in the news reporting hear compared to China. There is one English language TV News channel in China and all the local news is good news, it's only the coverage of other countries apart from China that say anything bad is happening. I particularly remember seeing interviews from some very scared Tibetian saying that they were really sorry that they had rioted when China had been so nice to them and their families,mmmmmmmmmmmmmmm? I wonder. Anyway watch out for those animal headlines and no I actually don't have any pets. Community Education what now ? It's a bit sad to find on my return that the community education debate has not been sorted out giving some favour to those organisations and people that have been keeping education going during the troubles and beyond . During the troubles many organisations set up in order to give education opportunity's to those who did not feel comfortable linking into the mainstream, after the ceasefires and when peace finds came to Northern Ireland lots of organisations developed innovative ways of reaching out to people and getting them involved with moving their lives forward in a positive way. The the peace finds come to an end what happens to those organisations, are they mainstreamed? do their innovative techniques of education be looked on as an exemplar ? or is the plug pulled ? Yes you've guessed it, the plug is pulled and all funds are directed to the FE collages which to many people is too far for a first step into education. Apparently the FE collage have got rid of their community education departments but they are still supposed to run community education through tenders . Interesting. My hope is that some sort of reasoning is found and that organisations and people that have kept the whole community education seen together over the years get a good opportunity to continue the excellent work going on .There are many organisations from overseas that look to N.I and see it as an innovative model, it's just locally that it seems to be ignored. Over the next few months I have decided to concentrate on my art . I've been working very have over the last year on training and development and the volunteer work that I'm involved in and just feel I'd like to spend some time on my art work. I've always managed to fit it in between other things I have been doing but now I feel I've earned a little space to do my own thing a bit more. This morning I was out in Holywood and I am please to say that I now have a number of pieces in The Yard Gallery http://www.yardgallery.com/ they have an interesting selection of work from mostly local artists and a great cup of coffee so if your down that way why not drop in and have a look around. 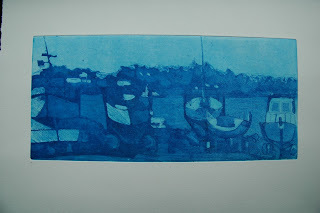 The print here in the blogg is shore road Portaferry, it's a view into the boat yard by moonlight its been quiet a popular print so far. I also had good success with http://www.basement-gallery.com/ when I was in China they had their Summer exhibition in Castle Coole and I was one of the 8 artists showing. It was great to get the news on my return that I had sold a number of prints. So all of this is positive as is I have come back from China with lots of shetches ideas and materials to try out. It's always the artist dilemma we love to make art but not necessarily sell it. So I recon the fact that I am a business advisor might give me a bit of a head start. I've got together an action plan and am working my way through it. So we shall see how the next few months pan out. To all those people who contacted me concerned that we got caught up in the earthquake I have to let you know that we got home safe and sound. We were actually in a taxi at the time in Shanghai and did not feel a thing . We went to visit a friend that was in an office in a high rise and he felt the windows shaking, had thought it was work men drilling in the road. We had moved out of the area a few days before. Quite horrendous when we finally got to see pictures of it and they are still finding bodies. I suspect they will continue to for a while yet. China has an army of 2.5 million and lots of them are busy in the rescue operation. The worst place to be at the time was in doors. Now they are worried about flooding because of cracks in the dams that have appeared. So after our China Odyssey what are the first thoughts on coming home to Belfast? Well actually the first thing we noticed was how crystal clear the air was and it was great to see a blue sky again, many areas in China are very polluted particularly Guiyang, where everyone drives with one hand on the horn of the car. It was nice getting back to clear cool air particularly as we stopped off in Dubai for a day on the way back and it was 39 degrees. Maybe our climate is not so bad after all? We also saw an article in China daily about the Economic conference in Belfast last week and it makes you realise just how much of a "special case" N.I has been. But you know what there is a big bad world out there that has better claim than we have on being a special case and the time is coming soon when dear old N.I will just have to stop holding it's hand out for money and sympathy and just get on with it. Guiyang in the Guizhou provience we are now further south in a city plonked in the strangest of landscapes, mountain's straight out of Chinese paintings. It's also were a lot of the ethnic minority's have retreated as there is less farm land and the Han Chinese did not want it as much. Yesterday we went to a Ming Dynasty village, beautiful buildings and roofs. One thing you really notice in China is that they have a one child policy in the city's, so when you are in the city's you see people cooing over their child. never a bad word is spoken to them, in the country side you can have more children as they are required to help their extended family with farm work and it is here that you start to see children looking a little less cared for. Dirty clothes and dirty noses. A few harsh words here and there. Everywhere you see women sweeping the streets, I even saw one working sweeping the streets with a baby on her back. How's that for childminding? Down here there are less people able to speak English, although all of the younger ones seem to . Apparently they start at 7 years old, if any other language is available it's English so at least that. We have managed to navigate our way on the buses, someone always helps us along. There is something that is strange, you can ask for something and they will say yes, yes, then half an hour later they will come bad and say no they don't have it. It's quite frustrating but they don't want to loose face so they keep agreeing with you. Since we have been in Guiyang we have to seen any other westerner, you do get looked at where ever you go. Last night we went for a walk along the river and there were loads of people doing ballroom dancing in the park it was quite a spectacle. The city we are in has the same population of the whole of Northern Ireland and they all beep their horns when driving. We are taking it easy today amybe just do and see something close buy. Labels: Guiyang, Guizhou, one child policy.